Otherwise known as the “Jesus Prayer”, members of the Assembly of Mshikhanim pray what we refer to as the “Yeshua Prayer” or “Yeshuan Prayer.” It is a simple, straightforward prayer that every believer should know and be able to say, from the heart, with true faith in His saving power. For monastics, this prayer is usually recited 100 times in a single session. 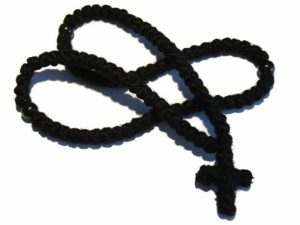 The monastic often uses a string consisting of 100 beads and a cross, or a rope of 100 knots. This practice is not limited to anchorites, hermits, monks or nuns. Leaders within the Religion of Light have encouraged its use for quite some time. Maran Yeshua Mshikha bar Alaha, have mercy on me, a sinner. Adonai Yeshua ha’Mashiach ben Elohim, have mercy on me, a sinner. Before I begin the chant of the Yeshua Prayer, I go to my chapel and sit in a comfortable chair, I start with saying, “In the name of the Father, and of the Son, and of the Holy Spirit.” (or the Hebrew or Aramaic variation of this). Some have asked about the history of the Yeshua Prayer. I found the following of interest. It is an excerpt from Tracing the Jesus Prayer Westward: Reaffirming Egyptian Influence on Western Monasticism in Late Antiquity by Patricia Ann Eshagh, Ph.D.
“In the ancient world, Egyptian monasticism became the standard model for exemplary asceticism. Its influence continued on to Europe in late antiquity and informed the development of western monasticism. Spiritual seekers learned the ways of the Egyptian monk by either reading authoritative texts such as the Life of Antony (Vita Antonii) or by hearing stories from people who visited monasteries in Egypt. Monastic texts documented the oral tradition of Egyptian monasticism, the experiences of visitors to its monastic communities and the lives of its spiritual leaders. These valued texts transformed people’s lives and shaped the way in which later generations approached their commitment to monastic life. “In the nineteenth century, scholars initiated a line of inquiry into monastic origins that resulted in damaging allegations against the legacy of Egyptian monasticism and its foundational texts. That investigation sparked an international debate between scholars who accepted the established Egyptian monastic tradition and the nontraditionalists, who set out to redefine its historic truth—a circuitous debate that continues to the present day.